Keep your pet healthy and prepared for a long, happy life with the NEW Wellness Kits for Cats. Each kit includes 4 essential items that both your pet and your pockletbook will love! Take advantage of the incredible savings now! Save up to $18.00 off of buying these items individually at their original prices. Buy them now in the Wellness Kit For Cats! Nu-Cat by Vetri-Science (100 tablets) Contains a full spectrum of balanced vitamins, minerals, amino acids, and digestive enzymes. Use daily for the best results. Vita-Soothe Aloe and Oatmeal shampoo (17 oz) This hypoallergic formulation also contains aloe, oatmeal, vitamins and emollients to restore natural moisture to the skin. Use weekly to maintain a healthy coat and skin. Otiderm Ear Cleansing Solution (8 oz) is specifically formulated to deodorize and gently clean, dry and acidify the ear canal. Use weekly to maintain the ideal environment for healthy ears. 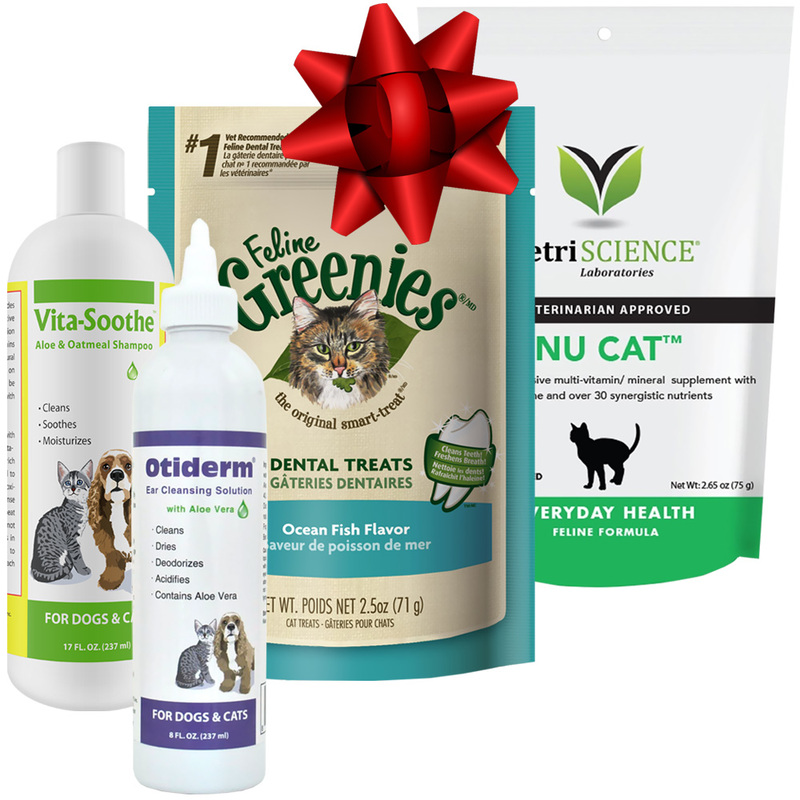 NEW Feline Greenies (3 oz) is scientifically formulated and clinically proven to mechanically reduce tartar buildup that can cause bad breath. As a treat between meals, Feline Greenies work like a little toothbrush to scrub your cat's teeth. For the best results, use on a regular basis.